Above, Carmel boys’ lacrosse players exult after a successful play against Brewster on Monday afternoon. At right, Brewster took on Our Lady of Lourdes in softball. Shown is pitcher is Evelyn Prinz firing one toward home plate on Monday. Results were… Please login below or purchase a subscription to the Putnam County Courier to access this content. While each of Putnam’s six school districts will be receiving increases in state aid for the 2017-18 school year, local school officials have indicated the additions will not cover mandated expenses. The New York State budget approved an additional $… Please login below or purchase a subscription to the Putnam County Courier to access this content. 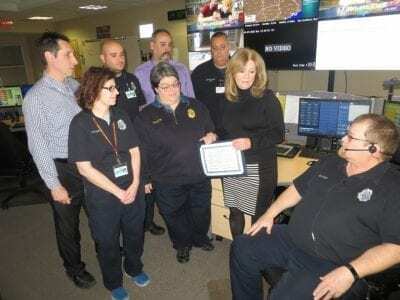 County Executive MaryEllen Odell joins Commissioner of Emergency Services Ken Clair and Deputy Commissioner Robert Lipton Monday at the Robert McMahon 911 Center to congratulate and thank Putnam’s 911 dispatchers for their dedicated work. Photo By Er… Please login below or purchase a subscription to the Putnam County Courier to access this content. An 84-year-old from Jefferson Valley is facing charges of weapons possession and menacing for allegedly pulling a knife on employees at a Town of Carmel supermarket. Carmel Police arrested Henry Scott last week following the alleged incident, which C… Please login below or purchase a subscription to the Putnam County Courier to access this content. A jogger from Brooklyn is facing a slew of felony charges following his arrest on Route 684 in Southeast. State Police arrested Roger Sherwood, 54, last Thursday morning at 4 a.m. after troopers received several reports of a man running in the northb… Please login below or purchase a subscription to the Putnam County Courier to access this content. 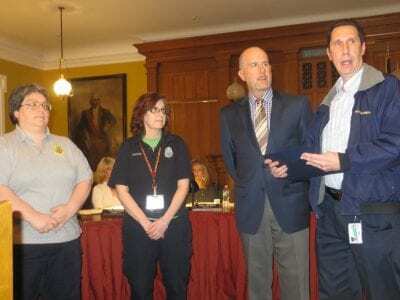 Assistant Commissioner of Emergency Services Robert Lipton praises the county’s 911 dispatchers when accepting the proclamation from Legislator Neal Sullivan pronouncing this week as Telecommunications Week countywide. Supervisor Cindy Jacobsen and d… Please login below or purchase a subscription to the Putnam County Courier to access this content. Snow Boots Vs. Rain Coats; The Battle for Spring! 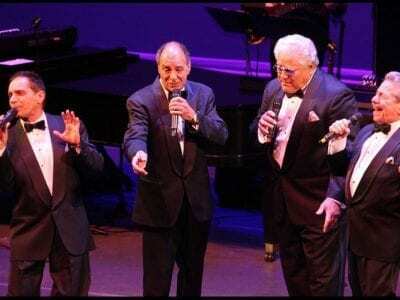 Headlining this year’s oldies show will be the Duprees. Photo by Earl BellowsGet those bell-bottom trousers out of storage. Clean up the white bucks or saddle shoes! Putnam County will be welcoming back several musical stars of yesteryear thanks to … Please login below or purchase a subscription to the Putnam County Courier to access this content.